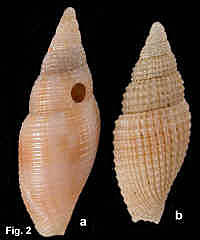 Description: Shell solid, whorls rounded, aperture equal to or less than half total shell length. Sculpture variable. At one extreme (as shown by the shell figured on the left) whole surface ornamented with strong spiral ribs, crossed by axial ribs of the same strength, forming nodules at the intersections; 3-5 spiral ribs on spire whorls and about 12 on the body whorl. 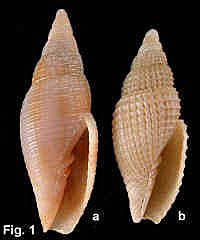 At other extreme (as shown by the shell figured on the right) axial ribs are absent and spiral ribs on the body whorl number up to 30, sometimes alternating large and small. Columella with 3-5 strong plaits. Outer lip sharp, crenulated in mature shells. Colour uniformly fawn or white, occasionally with wide, diffuse fawn bands, one on spire whorls and two on body whorl. Distribution: Australia and the Kermadec Islands. In Australia, Caloundra, Queensland, to Esperance, WA, including Tasmania. Habitat: Subtidal 7-376 metres, and rarely as a beach shell. It has been taken alive by scuba divers in Sydney Harbour in very muddy situations in 10-12 metres. Common. Synonyms: The form with strong axial ribs was named Cancilla nodostaminea Hedley 1912. Other synonyms are Mitra franciscana Tenison-Woods, 1877 and Mitra tasmantis Laseron, 1951.